The Palaexpo Conference Centre is an independent and easily accessible structure with a large forecourt car park. Located on three floors, it has 8 fully-equipped meeting rooms of variable capacity between 30 and 600 seats for a grand total of 1400. The halls are served by receptions, a spacious catering area, secretarial facilities, cloakroom, meeting rooms and a 2300 sq.m. multi-purpose hall. 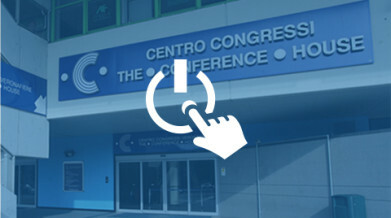 All meeting rooms are equipped with the latest amplification, reproduction and simultaneous translation technologies and can be inter-connected by an audio-video system. The Conference Centre, in addition, also meets the needs of the market for major events with two offers of outstanding excellence. The first is the 10,500 sq.m. area on the second floor of Palexpo. The entire area can be set up to respond to specific requirements and initiatives. It is ideal for creating impressively large plenary halls with up to 1200 seats, display, catering and poster areas. Another interesting offer is assured by Hall 1, an environment-friendly facility measuring 3400 sq.m. without columns and other obstructions that can be completely darkened complete with an industrial-quality kitchen. This versatile space is ideal for a huge range of solutions: for catering events with 1200 seats or as a Plenary Hall for up to 2400 people. More than 400 convention every year, more than 70,000 guests every year.